For decades dietary guidelines and health organizations have been recommending we eat a low fat diet. And the common dietary prescription given to people with type 2 diabetes and prediabetes is to eat less fat and protein and more carbohydrate. Personally this advice never made sense to me. Given the way the body works and the influence of carbohydrates on blood glucose, A1C, weight gain, and cholesterol, recommending more carbohydrates just never made any sense. In my mind I always felt like it was a fairly simple concept to understand and I became curious to understand why the nutrition recommendations for people with diabetes seemed so ‘off' the mark. So off I went to evaluate research paper after research paper, looking at the dietary comparisons and foods that made the biggest difference for people with type 2 diabetes and prediabetes. So my question was: why was this evidence not being passed on to people with diabetes and being reflected by a change to dietary guidelines? Well, it could all be a big food/ pharma conspiracy – sometimes I do think that. After all, there is a lot of money invested in junk food and keeping people sick. And it’s sad to say that many health organizations are ‘sponsored’ by big food and big pharma. Ha… like the current low fat diet recommendations haven't caused harm… Umm…hello health organizations, have you looked around at our rising health problems recently (obesity, diabetes, heart disease, cancer)? Are the current recommendations working? It's obviously questionable. In terms of health, we certainly have a BIG, BIG problem facing the world. It was estimated that we'd have 300 million people with diabetes by 2030. In 2011 we surpassed that number and now the estimate is 600 million – surely we need to start thinking differently! With all these questions in my mind, I started exploring new ways to eat to treat diabetes. And 4-5 years ago, there wasn’t much research around low carb diets, but there was enough to piece the puzzle together. For instance, back in 2014 there was an 8.1 year follow up of a 4 year trial. Here’s a snapshot of the results. 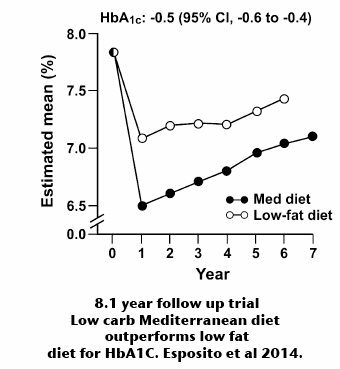 As you can see in the above image from Esposito's 8.1 year follow up study, the low carb Mediterranean diet outperformed the low fat diet for A1C. The original 2010 study also showed a significant reduction in medication use. That’s a 26% difference between a low carb and a low fat diet in the need for diabetic medication – worth more exploration? I think so. Low carb – 14.7% were in remission at year 1, 9.7% sustained at year 3, 5% sustained at year 6. Low fat – 4.1% were in remission at year 1, 4% sustained at year 3, 0% sustained at year 6. Overall the low carb diet proved best for achieving a complete remission, with 9.7% experiencing at least a 3 year remission. In the low fat group it was only 2%. Low carb 5.7% remission for 4 years vs low fat 0%. Low carb 2.9% remission for 5 years vs low fat 0%. I guess it's pretty clear which diet wins out here. The interesting thing about these results is that the carb intake wasn’t even that low carb (200 grams). But compared to the other group consuming 266 grams per day, the results were astounding. Overall it indicates that any reduction in carbs you can make will bring about better results long term. So, even several years back I was convinced that a lower carb plan was the best option to eat to treat diabetes. And since then, we’ve never looked back. We’ve been investigating research on diets and foods that can treat diabetes, and sharing it here with our readers and members. And the results continue to speak for themselves – not only through new research, but through the personal experiences of our members. Please pin, share or tweet – then keep on reading. When we started sharing research about lower carb diets, we were pioneers (and rebels of a sort) because health organizations and diabetes associations worldwide frowned upon a low carb diet. Surprisingly, there were even dietitian's that were deregistered because they were treating patients with a low carb diet – true story! One of the common debates from health organizations over the years, was that there aren't enough long term studies to prove that low carb diets are of any benefit and don't cause harm to people with type 2 diabetes or prediabetes. So, I wanted to explain research methods briefly, just to help put this debate in perspective. Randomized trials are the strongest type of evidence we have in nutrition science. It's where we take 2 or more groups, allocate them to a ‘treatment,’ otherwise known as an ‘intervention,’ and compare the results to a ‘control’ group. For instance, two groups of people with type 2 diabetes, one group on a low fat diet and the other group on a low carb diet. At the end of the study the results are compared. Randomized trials are also the most expensive to conduct because they involve much more labor, more testing, and to get good ‘proof' they are best conducted over long periods of time, with large groups if possible. That's why we lack a lot of long term studies, simply because the funding is not there. As a result of the lack of randomized trials available, we take a lot of our research and recommendations from large epidemiological studies, or observational studies. These are when we look at thousands or hundreds of thousands of people at a population level and try to determine an ‘association’ to things. For example, if I take 200,000 people's food diaries and compare them, can I make an association between sugar intake and risk of diabetes? Having the larger amount of people does give us some suggestion about associations. But, ‘association' does not mean ‘causation,' which is why we need randomized trials to help us determine ‘causation’ – we need to definitively test a hypothesis to determine a true outcome/cause. In human research, we also face another conundrum: the fact that many randomized trials can never be conducted because it's simply unethical. We can't use humans to do whatever experiments we want, which is unfortunately why we need to use animal studies. But then, the results we achieve from testing animals are not necessarily transferable to humans. It has always been so. It is up to the evidence and reasoning of whom is interpreting and translating that research into communications that get relayed to the public. And on a masse scale, one has to wonder, who's reasoning, interpretation and translation was it that led us to this place? The current dietary recommendations? Anyway, I just wanted you to know some of this ‘science-y' stuff because it helps put the whole debate and the whole idea of research and recommendations into perspective. Point being: there is still A LOT we need to learn. But, there is also a lot we know that works, based on good evidence, interpretation, reasoning and translation – that’s what we strive to share here at DMP. 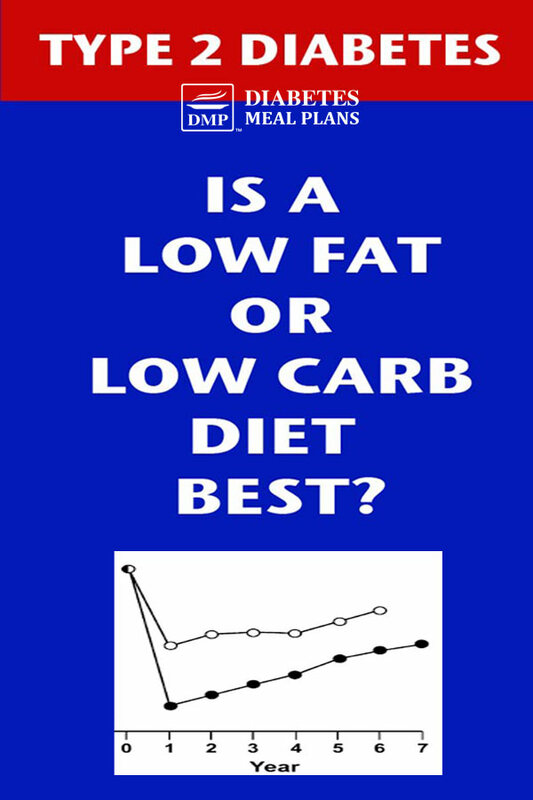 The great news is, there is more and more research being explored that compares the difference between low carb and low fat diets. And the results continue to surprise us – the outcomes on a lower carb diet are always better. Now, the evidence cannot be ignored and even health organizations and diabetes associations are trying to play their part. Slow progress is better than no progress! A 3 month 2018 study found that a low carb diet group consuming an average 39% carb calories achieved an A1c reduction of 0.63%. Compared to the low fat group consuming 56% carb calories who had a reduction of 0.31%. A 1 year 2017 randomized trial found that the low carb group had an average reduction in A1c of 0.5%, lost 17.4 pounds (7.9 kg), and 6/10 people stopped taking medications. Compared to the low fat group with reductions in A1c of just 0.2%, weight loss of 3.7 pounds (1.7 kg), with zero people stopping meds. Another 2017 6 month randomized study found people consuming 45% carbs (average 149 grams carbs) achieved an A1c reduction of 0.65% and an 18% reduction in insulin use. Compared to people consuming 50% carbs (average 198 grams carbs) who achieved 0% A1c reduction and 3% reduction in insulin use. This demonstrates that even seemingly small reductions in carbohydrate intake can have a large impact on results. Yet another 2017 32 week online study found people consuming an average 40 grams of carbs achieved a 0.8% reduction in A1c and 55% of people reached their goal of an A1c under 6.5%, and weight loss of 27.9 pounds (12.7 kg). Compared to a low fat diet with carb intake of 127 grams who achieved a 0.3% reduction in A1c but 0% of people achieved a goal of 6.5%, and weight loss of 6.6 pounds (3 kg). A 2015 1 year randomized trial found people consuming an average 64 grams carbs per day had similar results for A1c and weight loss compared to those consuming an average 200 grams carbs per day. However, 52% of those consuming 64 grams had an average 20% reduction in medication use, and another 29% had a 50% or more medication reduction. Compared to the low fat group who where 21% had a 20% reduction in meds and 18% had a 50% reduction. This significant reduction in the need for medication demonstrates that those consuming less carbohydrates had better overall glucose management. I could go on and on, but you get the point. That’s just a small sample of the results we are seeing from research directly comparing low fat diets to low carb diets. How many carbs are we talking about here? Current research demonstrates that both low carbohydrate diets (<26% carbs), and very low carb ketogenic diets (<10% carbs) provide the greatest benefits. We’ve found that a range between 50-80 grams of carbs per day works wonders. Keto diets (now very popular) can be more restrictive, many now sticking below 20 grams carbs per day. We’ve found a slightly higher carb intake still produces awesome results and is easier to maintain long term, providing more variety. Some of our members stick closer to 100 grams per day because that works okay for them, too. The important thing is to keep your food and blood sugar log so you can find that sweet spot for you. In recent years, it's not only low fat diet myths that have been blown out of the water. There have also been more and more ‘breakthroughs’ occurring in nutritional science that are changing the way we think. For instance, that a calorie is not a calorie. There have been health experts and researchers questioning this for several years. Just recently research from Harvard has shown that people following a low carb diet (20% of total calories) burn 209-278 more calories per day than those on a high carb diet (60% of total calories). This study bursts all the bubbles that suggest consuming fat is what makes us fat! P.S. Our very own dietitian Emily Incledon was involved in conducting this study through Harvard’s partnership with Framingham State University. Another example of nutritional breakthroughs is around cholesterol. We all know the commonly touted belief that the cholesterol you eat means you’ll get higher blood cholesterol – therefore, avoid eggs, especially the yolks, fat, avocados etc. This is entirely inaccurate. The dietary advice to limit cholesterol intake was never backed by science. Even the American Dietary Guidelines Committee have openly admitted it. In fact, studies are showing foods such as eggs – which are naturally high in cholesterol – actually improve blood cholesterol levels. While multiple studies show excess carbohydrate consumption increases cholesterol levels. And so to, lower carb diets are demonstrating better results in terms of cholesterol, despite the increase in fat intake. For instance, a 2010 study found HDL cholesterol only increased in the low carb group 1.8 mg/dl (0.1 mmol/l), not the low fat group. And the reduction in triglycerides was more on the low carb diet 23.4 mg/dl (1.3 mmol/l) compared to the low fat American Diabetes Association diet 12.6 mg/dl (0.7 mmol/l). New Frontiers in Neurology have just released a new observation that low LDL cholesterol may actually increase risk of dementia. Dementia is closely connected to diabetes. LDL is meant to be the “bad stuff” that we’re told to reduce. So it just goes to show how much is yet to be discovered! 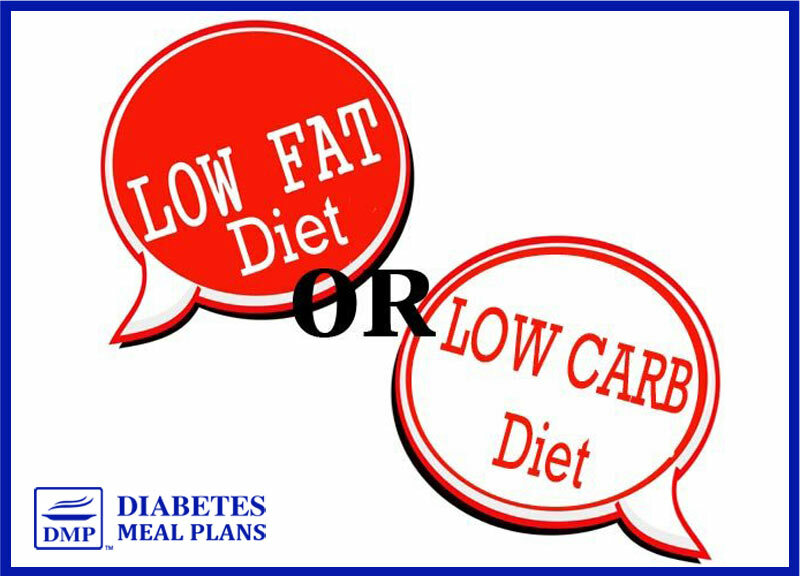 Coming back to the initial question: is a low fat or low carb diet best for diabetes? Low fat? Or low carb? 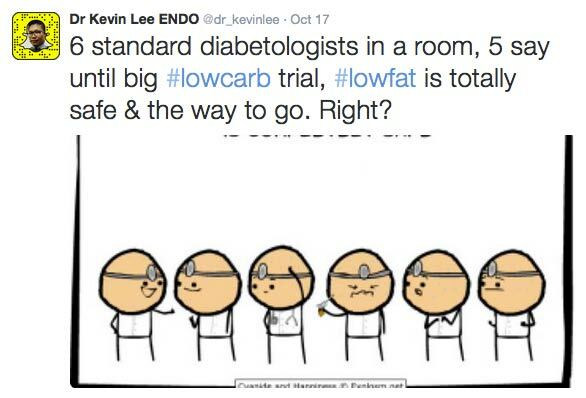 We vote low carb because science continuously shows that it is one of the best ways to eat to treat diabetes! There’s lots of exciting science occurring. And the truth is, no one has all the answers. If they did we’d have the world’s health problems solved. But groups like us here at DMP, along with researchers and organizations are continuously staying on top of the latest science and working toward finding a solution that could work on scale. In fact, that’s why we have online services and programs, so we can share our message and reach more people with quality information that helps you eat to treat your diabetes. I am also proud to sat that DMP will be adding a great deal to scientific research, as starting in March 2019, I will be conducting my own PhD research study on the effectiveness of an internet-based low carb diet. The study hopes to show that a low carb diet is more effective in reducing A1c. And that running a program online is also more cost effective than traditional care. Both of which could open doors for government funding to enable effective online dietary programs to be delivered to more people. While you're here, Click Here to Subscribe to DMP's Weekly Nutriton Newsletter – get the latest updates on how to eat to treat diabetes. Good morning! This is Debra checking in and I have a question. I am trying to follow the low carb diet on DMP, but also restrict my bad fat to little or none. I do have olive oil, avacados and nuts for healthy fats. I’m trying to loose over 100 lbs. I’m not loosing weight just maintaining. Can you advice me on what I’m doing wrong? My brain for years has been programmed for low fat diet and I’m trying to go low carb, but find I’m mixing two different kind of diets for results. Is that why I’m not seeing results? There is no ‘bad fat’ if it comes from natural food sources. The low fat diet thinking has really made us believe this, but more and more research shows this is not true. As for weight loss it can be numerous things – calories consumed, fiber consumption, ratio of foods, type of foods, exercise, or even stress and lack of sleep. If you’re not losing weight, it may indicate something needs to change so you have to start eliminating possibilities, or tweaking things a bit. Also, try taking a tablespoon of apple cider about 15 minutes before meals. Milk thistle can also help boost metabolism and cleanse the liver. And keep at it – it will take time. What is the effect of low carb diet on thyroid dysfunction( hypothyroidism/hyperthyroidism,etc.)? If i may suggests what about writing an article on hypothyroidism vis-a-vis low carb diet and type diabetes? thanks a lot. Following a low carb diet can certainly help with weight management in thyroid disease, which is typically more of a problem in hypothyroidism. This is definitely something we will consider exploring for a future article. Got it down to 176 before lunch. Before dinner…it was 145. I picked up my new freestyle libre meter. When I first became pre-diabetic many people said eat more carbs. The Doctor said watch your sugar intake. I did not listen to any of those advices. 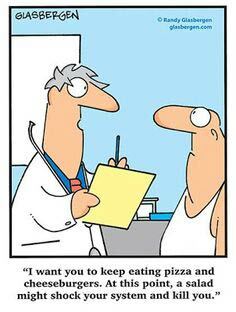 I always believed it was the carbs and not exercising. Good information keep it coming. Thank you for being so generous with your information. I’m a long-term Type 2 diabetes patient (with high cholesterol and atrial fibrillation to boot) and have recently resolved to be more serious with my diet. For my main meals I have now switched to chapati (Indian wholemeal flat bread), soba (Japanese buckwheat noodles) and Polenta bakes for my carbo, usually taken with half a plate of leafy veg.and a little meat. Plus i have started on a regime of taiji based exercise (half-hour 3 times a week). I hope to see good results soon. I have only been doing low carb for maybe 5 or 6 days, l’m not sure. I’m not where my log is right now but l have lost 7.4 pounds in that amount of time. I have more energy, due to just walking to my friends house and not just lying around watching TV. I am very pleased with my results. I love learning more, even my doctor hasn’t told me this much or the diabetic educator. Thank you for caring so much about diabetes. I value all the education l’m getting. I have been diabetic for 13 years or longer and have not known this much info. Thanks again. You’ll find plenty of info to help here Ntombi! This article has really helped me understand diabetes and my diet needs. I was diagnosed with diabetes type 2 only 10 days ago and I’ve been struggling with my diet as I haven’t had an appointment with the dietician yet. I feel like today after reading this I can look after myself by eating a low carb diet. I am a savoury head so will miss my baked, mashed, roast, chipped potatoes so much but I’m sure Il find some healthier options in your meal plans…. So glad I’ve found you… Where do I sign up? Welcome Tracey, so glad you found us too! To get started, you might like to take our free carb course. Or you can join our 30 Day Turnaround Program or VIP membership. I have also read about the lower carb approach through other sites and I can tell a difference in how I feel on days that my carbs are lowest. I am looking forward to the recipes and examples of how to substitute for things I have been eating my whole life. Just realizing how things are hidden in processed foods is sickening! Yes, it’s sad that we have been deceived. But unfortunately food companies have more money than public health. From the research it is pretty clear that low carb is best for diabetics. People are getting off meds and getting back to normal, and that’s saying a lot to the ‘common’ recommendation, which clearly isn’t helping anyone, only driving more people toward diabetes or progressively worse health. I have read this article with great interest. Five months ago diagnosed with diabetes2. Went to diabetes forum. They kept talking about eating correct amount of carbohydrates and watching fats. The dietitian conducting it was morbidly obese. I cut out sugars, hardly any carbs and ate more good fats. Increased my protein intake. Conclusion lost weight went back to my doctor for tests and he told me that i no longer came up as diabetic but of course to keep doing what i was doing as i would always be a diabetic but could keep it under control. I will not be going back t these forums until they change to our way of thinking. At the forum the understanding we got that we would gradually go onto medication then further down the track it would be injections. It has left me a little angry at what they are telling people. I realise that the drug companys run these forums and the government goes along with it. Well thank goodness you had the motivation to look after yourself. Unfortunately this is a story I hear all too much and I also find it totally disgraceful. How can people feel empowered when they are being told their life is destined for decline? Why would you even bother? I know people who have said they have just given up because of this and that’s terrible. I get angry too Pearl, upset really that so many people could be helped but aren’t. The article was very informative. Thank you.